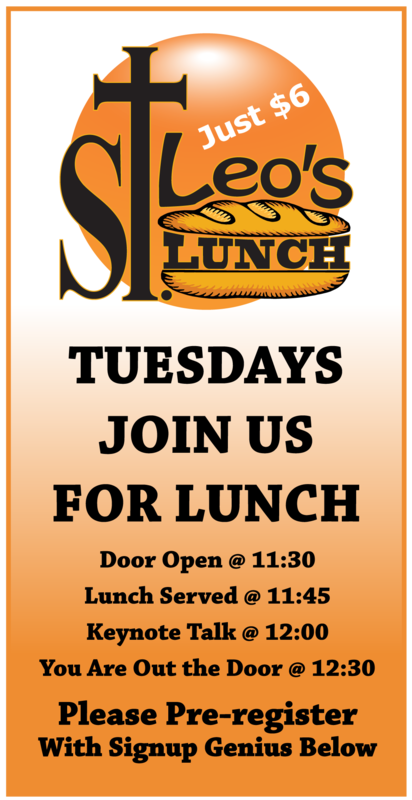 Speed up your check in at St Leo’s lunch. Order your printed name tag here (you only need to do this once) http://stleoslunch.com/name-tag-registration and pay in advance before each upcoming Leo’s lunch and skip the line. Please pay no later than Monday of each week. If you prepay you do not need to RSVP via Signup genius. Click the Buy Now button to prepay for next Tuesday’s lunch. Help our High School and College men and our religious eat free by clicking the donate button below.